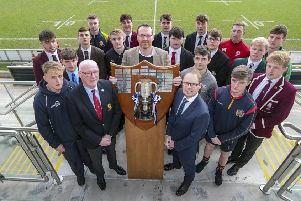 Friday night’s First Trust Senior Cup final is a repeat of last year’s confrontation when holder City of Armagh face Ballymena at Kingspan Stadium (7:30pm). A 17-13 triumph over the Braidmen secured an historic first for the Orchard County men, lifting the Ulster Senior Cup for the first time. And having secured back-to-back SONI Ulster Rugby Premiership’s either side of that success, the Armagh men are hoping they can do the same in the First Trust Cup. That success last season - on their first ever appearance in the final - qualified them as the Ulster representatives in the All Ireland Bateman Senior Cup. A recent win over Connacht side Buccanners in the semi-final has set them on their way to a final showdown with Munster club Garryowen in April. Last season also saw the Palace Grounds club gain promotion to Ulster Bank Division 1B in the All Ireland League, and their first season has gone solidly, currently sitting in sixth place - but only five points adrift of leaders Malone. It has not been all on the up for the boys from Co Armagh - having secured back-to-back SONI Premiership titles, they have been relegated to Division B for next season. Both they and Ballymena finished bottom of the top flight, but the Braidmen had won the head-to-head fixture 24-21 at Armagh and that was enough to keep them up. In terms of success in recent seasons, Ballymena have been battling hard to stay in Ulster Bank Division 1B and find themselves at the bottom of the current standings, in spite of a resurgent spell pre Christmas. However, they are only seven points adrift of Armagh to paint a picture of how close it is in the section and while they won the SONI Premiership game at Armagh, they fell at home 22-13 in the All Ireland encounter. 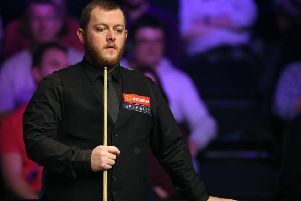 Another appearance in the Cup final is a huge boost for Andy Graham’s side. They certainly had the harder run to Kingspan winning away, 22-18, against Dungannon in the first round before accounting for fellow Division 1B clubs Malone and Ballynahinch in the quarter and semi-finals respectively. Centre Matthew Norris still feels the pain from last season in a final when Ballymena looked to be heading for a first success since 2013 - having previously lost out in 2016 before last year. “We were up most of the game but things just turned against us,” he said, referencing a yellow card to a team mate when they were 13-3 ahead around the hour mark. He added: “Armagh have been our bogey team over the last few years and we’ve really struggled with them. “They had a big support last year and we didn’t have as many so that’s something that’s in the back of your mind. “We’ve kept that feeling of losing last year. Norris went on: “Having the final is something we have been able to focus in on. “We had a decent enough run before Christmas, but things have not gone our way since then. “However we know we are bottom, but we also know that two wins can shoot you up the table it is so close. City of Armagh’s rise as one of the top senior clubs in Ulster has just not been a bolt from the blue. They have been building as a cup for many years now and it is interesting to note they have no Ulster players or contracted players attached to the club - it is all mostly home grown talent. Several of the players have come through the mini section at the club or have played together at Royal School Armagh - and indeed some of those at other schools have been involved at the club in some way previously. Three promotions in the All Ireland League has lifted Armagh to Division 1B and they have shown they can more than hold their own. The first Senior League success two seasons ago was a major achievement for the club and then winning the Senior Cup to continue the history writing was massive for them. Scrumhalf Harry Doyle said: “It was a dream come true last year. “When I was playing junior rugby with the club played in plenty of Junior Cup finals, but I never thought we would end up playing in a Senior Cup final. Reflecting on the final last time against Ballymena, Doyle said: “It was a titanic tussle, two really good sides going hard for 80 plus minutes. “The game went right to the end. We were dead and buried potentially after about 63 minutes we were 13-3 down and Ballymena were well on top and last 15 minutes we sparked and scored two tries. “The whole squad, there were 20 guys that night, and it took them all, to be honest it was an unbelievable moment. “We were at school together a lot of the guys who had played at RS Armagh and some other boys from other schools who came through the youth section together. There is no secret to the success Armagh have enjoyed in recent seasons explains Doyle. “We are a close bunch of lads. Played together for years - I feel I am getting old - we do a lot of team bonding things off the field, socialising together, and our coaches as well. “Building relationships within the squad is important and that is a key, if we can be friends off the field you can bring that onto the field and in the heat of the battle that can be really important especially against a big team like Ballymena. “There is no real method to it, we know we are up against it week in and week out. Armagh have enjoyed a huge support both at home and away and the red and black took over Kingspan last season. Doyle says winning the trophy again would be simply fantastic for everyone involved. “Getting to the senior cup final was a credit to everyone involved last year and if we could lift it again it would be hard to believe. Tickets (general admission) can be purchased in advance online from www.ulsterrugby.com/buytickets, or on the gate from 6.30pm on match day. Advance online purchase prices: Adults £8, Juniors £4, Under 5s go FREE. Match day gate prices: Adults £10, Juniors £5, Under 5s go FREE.